Smooth and supple, nutty and fruity. 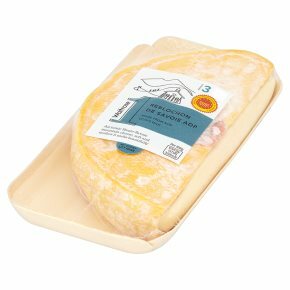 Reblochon is an Alpine cheese from the Haut-Savoie. It is a creamy, supple, washed rind, cows milk cheese dotted with small holes. With fantastic melting qualities, it is the perfect cheese to combine with potatoes in the famous Alpine dish "Tartiflette". Reblochon is a classic French mountain cheese, made in the Haute-Savoie region. Known for its superb melting quality, it's traditionally used in the Alpine dish tartiflette, a gratin of potatoes, bacon and onions.